I have to hand it to Hockey Night in Canada: the NHL gave them lemons this year and they made lemonade, then shared it with everyone that loves the game. After all, I’m a Leafs fan ( … well, I’d like to be). 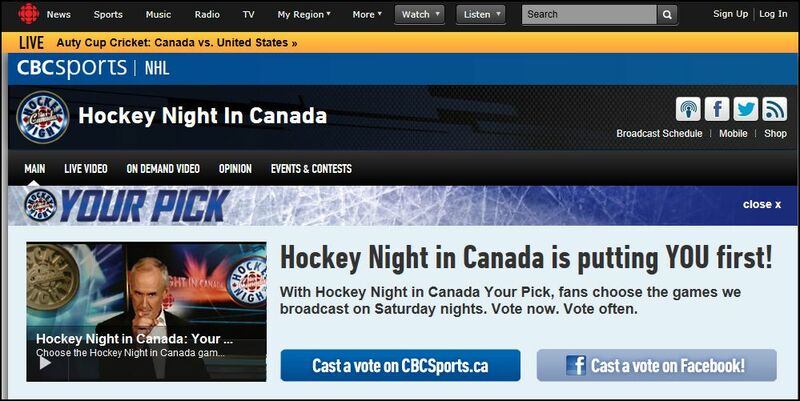 I don’t follow Montreal or Boston or Edmonton or many of the other teams that Hockey Night in Canada is showing in their Saturday Night, Your Pick program. But they haven’t lost me as a viewer. In fact, quite the contrary, I’ve watched as many games as usual but I’ve enjoyed the experience considerably more. I’ve gone out of my way to vote, share my selections with friends and tune in to watch. That’s largely because Hockey Night in Canada makes it easy for me to get involved and spread the news through social media. And every time I move on to other priorities, they give me a gentle reminder on TV or a timely tweet on twitter to remember to vote for next week’s game. Fans helping fans. Who could ask for more than that. This entry was posted in Business, Digital & Social Media, Uncategorized and tagged hockey, Hockey Night in Canada, hockey strike, National Hockey League, NHL, NHL strike, sharing, social media, sports, Your Pick by greg kavander. Bookmark the permalink. Loving the chance to see my 1970’s HABS play again! GO HABS GO! 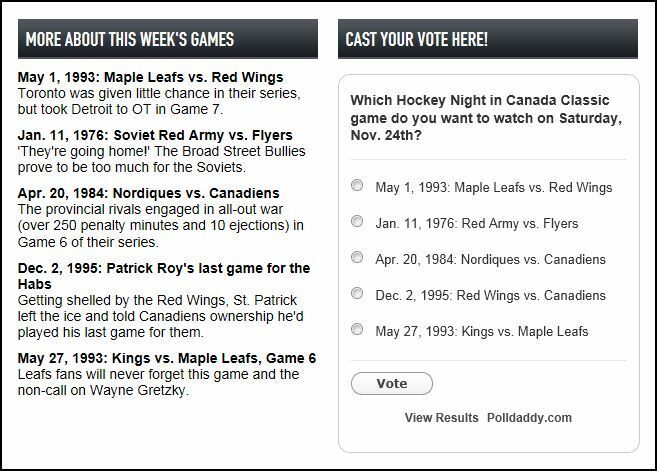 Ah, yes, the good old days … when the Leafs used to make the playoffs every year.